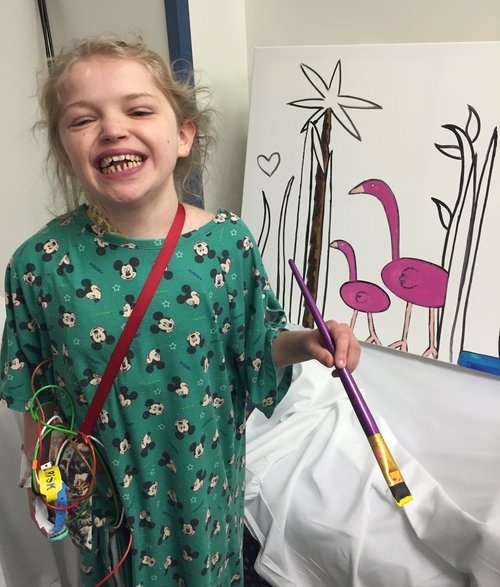 The Visiting at Nemours program was developed in partnership with Lindsay Lederman, MPS, ATR-BC, LCAT, Art Therapist at Nemours Alfred I. duPont Hospital for Children. The program is designed to give patients, family and staff a unique opportunity to come together to create new works of art for their respective wings. The process of working on the project, and the final result that is a mural on canvas provides a pleasant distraction and a beautiful work of art inspired by the participants and their experiences, left behind for future patients and families to take comfort in. When dealing with a recurring or serious illness, hospitals become your home. For some patients, they are restricted to the hospital, or in severe cases to their beds, for long periods of time. In these instances, it's important to encourage the use of imagination as a method of transportation to the outside world. 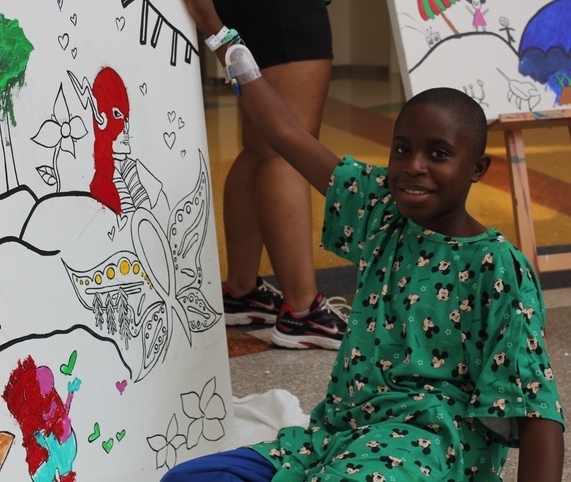 Fueled by books, television and the infinite possibilities of dreams, the patients came up with some incredible and whimsical drawings that were used for the inspiration in our most recent mural at Nemours/A.I. DuPont Hospital for Children. Lost in a Daydream was unveiled on April 3, 2017 and displayed in the open before being installed in its permanent location on the fourth floor of the hospital. With Love, Warmth and Healing, we finished off the summer with our third project at Nemours/A.I. DuPont Hospital for Children in the cardiac unit. This time we saw increased participation from both the nurses and the families of the patients. We were so happy to see everyone come together to draw, paint and have fun with us! 13 patients, 11 family members, and 8 staff members from the cardiac unit joined us for this one to brighten their wing of the hospital. Many smiles were shared in the making and even more at the final presentation on September 6, 2016. This marks the end of a solid year working with Lindsay Lederman, MPS, ATR-BC, registered and board certified art therapist, and the Child Life, Creative Arts Therapy and School Programs to bring this project to three different units. We can't wait to pick it back up in 2017! Trees of Tranquility kicked off a summer at Nemours/A.I. DuPont Hospital for Children working with art therapist, Lindsay Lederman, and the patients and families in the PICU. In April we held a drawing session to solicit images in the theme of peace and tranquility. From here we came up with a design that represented the theme and the inspiration drawn from the participants. After recreating this design across eight canvases in black and white outlines, the patients and family members were invited once again to join in painting in the outlines. The canvases were finalized in the studio and then presented on June 1, 2016, in the PICU Solarium where they are now permanently installed. Reason to Smile was completed in partnership with art therapist Lindsay Lederman to give the patients a unique opportunity to come together and create a mural on canvas inspired by all the many reasons there are to smile. The design came from the patients drawings that were recreated on canvas and brought to life during a session of painting with the patients. After some time in the studio, the final result was presented on November 5, 2015 at Nemours/A.I. DuPont Hospital for Children where it was on display in the atrium before being installed in its permanent location in the 3 West wing.